At last! It's only taken me seven years, but I finally broke my marathon PB today in 3:50:00. It was the perfect course for a fast marathon - dead flat and almost 12 laps of a 2.2 mile course. The race was organized by the excellent Beyond The Limitations and was run concurrently with a 50k and 100k. There was a single finish line and three starts, depending on which distance you were running. It was a bit of a trek to the marathon start line and I missed the official start by a couple of minutes, with many more behind me. Not to worry, as it was chip timed. I quickly settled into a steady pace, running each lap in about the same time, give or take 30-40 seconds. The lap was all tarmac on very quiet country lanes and broken up by plenty of bends in the road. It was great fun to see the serious runners flying past, and that includes some of the 100k runners! The winner finished in an incredible 7:07. The running felt great and apart from a slight headwind into the straight section and a barely perceptible incline in one place, the course was fast. I'm not used to running flat, road marathons! The weather started off warmish and overcast, getting sunnier towards the end, but fortunately not too hot for running. I started to feel the effort with about three laps to go and my pace deteriorated a little, but I was so excited at the prospect of a PB, that I pushed on, trying to ignore cramp in my calves on the last lap, to take over 7 minutes off my PB. 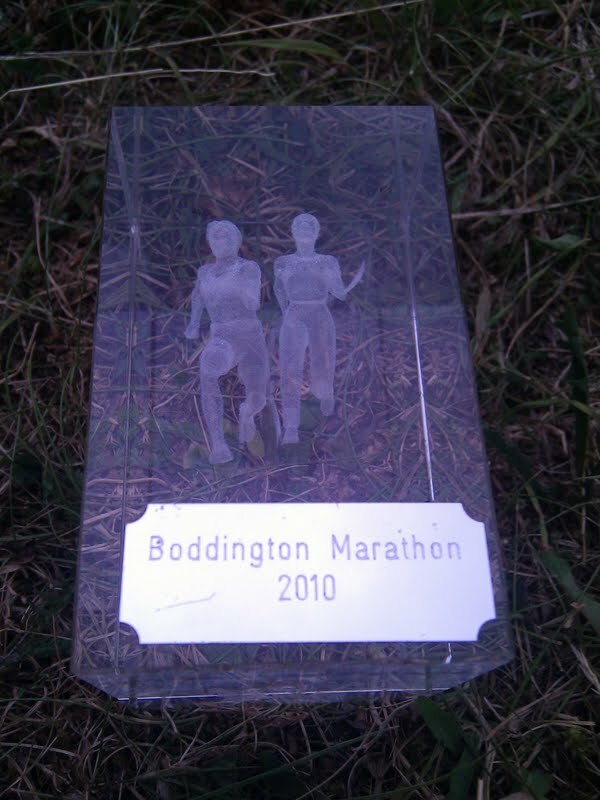 I just managed to pip a 68 year old from the 100 marathon club to the line - inspiration for me to keep running and was rewarded with tea, cake and a nice piece of glass. And that was marathon number 19 for me.